A Broadwood square piano, it is dated 1856. It was given to Worthing Museum for safe keeping March 1966, but housed in a private home. I remember this lovely old piano well and would pick out tunes as a child, although I was never taught properly. It is sad now to think how this lovely instrument was bundled from one house to another whilst we constantly moved house. Some houses were too small (curate’s dwellings) so items would be stacked on top of the piano. Some houses were large and damp as we couldn’t heat the large rectories adequately, but it survived! 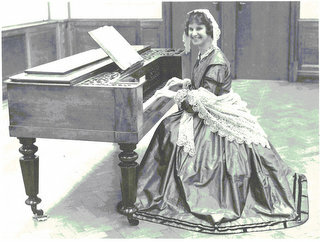 The piano was a gift to Emma Hubbard (née Evans) on the occasion of her marriage to John Waddington Hubbard - 10 Jan 1856. He was a doctor in Market Bosworth and she the daughter of the headmaster at the Free Grammar School, Market Bosworth. They lived in Church Street. Emma's father was Arthur Benoni Evans, headmaster. A letter from my father, George Edward Hubbard to his sister Frances Ann Roper. Mother was extremely musical, and could play the piano very well, she could also compose the most charming little things as easily and spontaneously as she could invent stories, though unfortunately she seldom troubled to write them down. She started teaching me the piano when I was still so small that the music stool had to be twirled to its highest limit and a couple of thick books placed on top for me to sit on before my hands could achieve the correct position. I well remember my thrill when my fingers at last became long enough to strike an octave, though they eventually lengthened to such an extent that I can easily strike two notes beyond the octave. I have always had difficulty in playing passages in octaves, as my natural span is one beyond, which is disastrous. Mother’s teaching of the piano was as thorough and as old fashioned as her teaching of all other subjects. Commencing with five finger exercises, followed by scales in all their variations, and later by chromatics and arpeggios, I waded stolidly through the lot. I learnt Hamilton from cover to cover, followed by Czerny, and later by Heller’s Studies. There were no easy short cuts or tempting by paths along which children of later generations seem to be lured towards proficiency on the piano. I have stated earlier that Mother never spanked me, but there was just one occasion upon which her musical ear was outraged to the extent of overcoming her almost unbounded self control. There was a certain horrid little piece in Hamilton, called “Trab Trab” which I hated, and therefore found exceedingly difficult. I had to practise for half an hour, and later on for an hour, every day, and Mother gave me a lesson once a week. On this famous occasion I persistently played a wrong note in “Trab Trab”. Over and over again Mother stopped me and made me play it again, till I was reduced to such a state of nervous terror that I became completely incapable of striking the right note, try as I would. I was not being deliberately naughty, I was literally paralysed by the atmosphere of Mother’s mounting displeasure. Suddenly her patience snapped, and her hand came down with a smart slap on mine, crashing a discord on the keys. Laughing about it in later years Mother told me that I immediately dropped my hands in my lap, and turned and gazed up in her face, eyes and mouth open in blank amazement. She said that she was extremely repentant for her outbreak, but my speechless astonishment was so comical that it was all she could do not to laugh. My main recollection of the incident is a sense of inward triumph. I had often read and heard about spanking, but now I had actually experienced it! I have often thought that a few more spankings would have done me all the good in the world, and they would certainly have been far less alarming than the strain of Mothers controlled displeasure. Our piano was a very old Broadwood, and had been in Father’s family for generations. It was of the earliest type after the spinet, a type which is now seldom seen except in an antique shop converted into a writing desk or cocktail cabinet. A year or two ago, when touring in Northern Ireland I came across a similar piano in a old small hotel where we stopped for lunch. It was so exactly like our friend that I spent far more time purring over it, and trying its soft, sweet tones, than I devoted to my lunch. The teaching that Mother gave me was so good that when I went to school I was the only one in the junior house of about sixty girls who was advanced enough to take lessons from the music mistress of the senior school. I loved music as passionately as Mother did, and kept it up for many years after leaving school, becoming eventually almost good enough for the concert platform. Later circumstances obliged me to drop it entirely, and for years now I have hardly ever had the opportunity of touching a piano, and if ever I do get the chance, my unpractised touch and forgotten technique are a source of sore misery to me. I still cling, however, to my dreams of once again possessing a piano, and, more unattainable, still of having the time and facilities to devote to recapturing my early prowess.